Global bodies such as the World Trade Organisation (WTO), World Bank, International Monetary Fund (IMF) that are directly and indirectly promoting a host of multilateral and bilateral trade agreements have created a criminal level of inequality in this world, wherein according to reports, 82% of the world’s wealth is now controlled by merely 1% of the people. 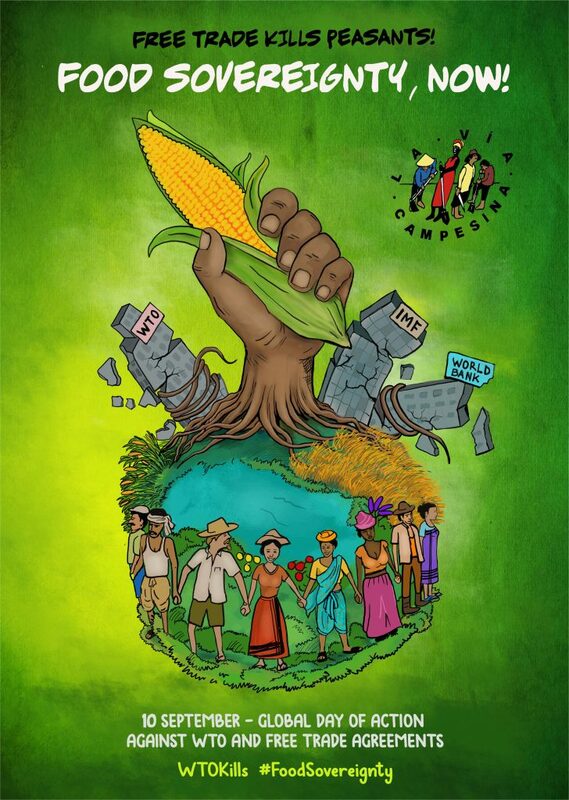 Global Hunger is again on the rise, with peoples’ food sovereignty under severe threat. This comes on the back of a seven-decade long persistent push for neo-liberal policies, which called for ‘free market trade’ regimes around the world. Privatisation and de-regulation that came about as the consequences of such a push has evidently made the rich richer, while poverty and world hunger continue to remain at staggeringly high levels. It is an unpardonable offence that brings into question the purpose of existence of these institutions and the Free Trade Agreements they promote. All that these agreements have ensured is the freedom for Multinational Corporations to dump cheap food into economically weaker countries, after having received heavy subsidies from their rich governments. Such dumping and a push for an industrial agricultural system has ended up treating food grains as a commodity for trade, as a commodity to be speculated upon – with peasants and family farmers unable to meet even the cost of cultivation. It has destroyed rural peasant communities, fishers and our peasant markets. Increased privatisation of services have increased the cost of living, while income levels of peasant households have plunged. The resulting debt has pushed millions of peasants households into deep debt. This industrial system of agriculture promoted by the criminal trio of WTO, World Bank and IMF, has led to consolidation and control of the global food chain into the hands of a few agribusiness corporations, while creating devastating impact for the planet, its people and all the living species. It was to highlight this extreme violation of the rural side, that on 10 September 2003, Lee Kyung Hae – a rice farmer from South Korea and a leader of our peasant movement – took his own life outside the Ministerial meeting of WTO in Cancun, Mexico. While sacrificing his life to expose the crimes of WTO and Free Trade Agreements, Lee was holding a placard that read “WTO Kills Farmers”. Since that day, we have come to mark 10 September as the Global Day of Action Against WTO and Free Trade Agreements, mobilising our peasant members against the assault of global capital and free market regimes. We have denounced WTO at all the ministerial meetings held ever since through direct actions. This year too, we will continue the resistance. Several multi-lateral and bilateral agreements such as RCEP, CPTPP, EU-Mercosur, CETA and more are being frantically negotiated by countries and global bodies behind closed doors, with no respect to democracy and national sovereignty. In the run up to September 10, we call upon all our members, allies, supporters in the cities and the country sides and all friends to organise marches, public meetings and rural actions that will continue to denounce the existence of WTO, World Bank, IMF as well as expose the details of these agreements that threaten to take away people’s food sovereignty and allow expansion of markets for multinational agribusinesses. Let us all, in our own decentralised and diverse ways of struggle, echo the call Lee Kyung Hae gave us –“WTO and Free Trade Agreements Kills Peasants”. La Via Campesina will also soon be announcing a massive mobilisation effort against criminal trio of World Bank, IMF and WTO. We urge every member to stay together and show the power of people’s resistance. TAKE AGRICULTURE OUT OF ALL FREE TRADE NEGOTIATIONS! WE WANT FOOD SOVEREIGNTY, NOT FREE TRADE! Current students may enroll in STOCKSCH 356 – Food Justice and Policy this semester. If you have difficulty enrolling (non-majors are welcome), contact the instructor Catherine Sands before Friday, September 14 for assistance.